If you are like I was about 5 years ago, you are wondering: What in the world is stromboli? I am here to educate you! Stromboli is sort of like a turn over, filled with meats, cheeses, and veggies. It’s like a calzone only in a loaf form. And once you embrace the idea of stromboli, you will fall in love! When you search for stromboli recipes, you will find that some use Pillsbury dough, some use frozen bread dough, some pizza dough, and some homemade dough. We have used Pillsbury’s french loaf dough and their pizza dough. I like the french loaf better, it comes out with a crispy outside. However, I have not found it easy to freeze stromboli made with this. So, we like to use frozen bread dough when freezing stromboli. I just buy Rhodes or Bridgeford’s in the frozen food section of the grocery store. There are three loaves to a package, so why not eat one stromboli & freeze the others for later? You could also use homemade pizza dough. Erin has a recipe for pizza dough here that might work. Thaw & roll out the dough into a rectangle. Use lots of flour to help the dough not stick to your cutting board or rolling pin. Place your filling down the center. Pull the long edges together & pinch to seal. If you can’t seal the edges because of all the flour, rub with a little bit of water on the edges to seal. Place stromboli on a sheet of heavy duty aluminum foil sprinkled with flour (you don’t want to the stromboli to stick to the foil). Freeze! Some folks like to then wrap the stromboli in plastic wrap or a freezer bag, but the heavy duty foil works fine by itself for me. On cooking day, thaw the stromboli all day. Unwrap & place on a cookie sheet. Cut a few slits in the top to allow steam to escape. Brush with butter or egg according to the recipe & bake according to the recipe. Slice & eat! 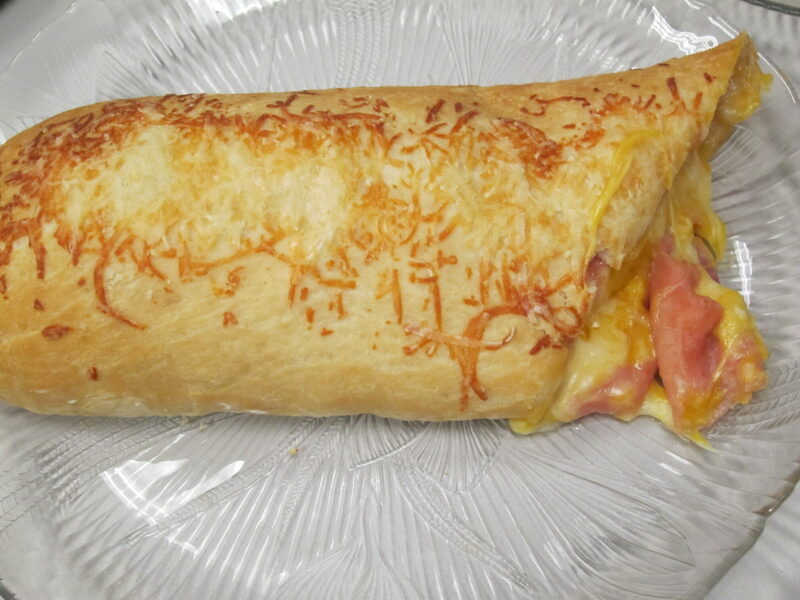 We love stromboli filled with ham & cheese and it quickly became our favorite recipe. We like to use a mixture of mozzarella & cheddar cheese. When I freeze it, I do change the dough from Pillsbury dough to frozen bread dough. I also don’t brush it with butter & sprinkle the Parmesan cheese on until right before baking. You can freeze butter & shredded cheese though, so just package those two ingredients separately so they are ready for you. We have also tried this recipe for a Greek inspired stromboli and everyone raves about it. We used to live in West Virginia where pepperoni rolls are a huge deal. So, what about filling a stromboli with mozzarella & pepperonis? Then dip in marinara! YUM! I used to be a Pampered Chef consultant & have made countless numbers of their rings & braids. I bet many of the fillings would be great inside a stromboli. Check out any of their cookbooks or just do a Google search. I think the taco ring filling or the chicken broccoli filling would taste fantastic. Do a search on All Recipes or Taste of Home, there are lots of ideas! Try your own ideas! You can practically fill a stromboli with anything! What sounds good to you? Please leave a comment with your ideas! Joy is a stay-at-home wife & mother to two wonderful children. She is a fourth generation freezer cook. Growing up with freezer cooking as a way of life made it hard for her to understand how folks could NOT use their freezers. After being asked again and again for help, she started her Facebook page, Fearless Freezer Cooking, to give her tips & insight so that others will be Fearless Freezer cooks, too! I just bought some dough to make something like this. I never even considered freezing it. Now I think I will wait to make it until after my next grocery store run so I can make a couple at once to freeze. Thanks for the tip! We love ham and cheese pizza, but will be trying this soon! I love the idea of freezing it! We do leftover shredded meat and BBQ sauce– sometimes we add cheese and/or pickles and/or onions and green peppers. I also like turkey, broccoli and cheese. Great way to use up/stretch leftovers and the varioations are endless– you can make them family size or make them “hot pocket size” I tend to bake and then freeze, but that’s personal prefernce too…. This a great way to use up pizza crust, french loaf, even biscuits. When there is a good sale, we stalk up but always run out of ways to use them. This would be a great way to use them up and have something nice to eat for later! Oh my! Followed the link to the Greek inspired, which led to a “French Bread-My Way” recipe. Just knocked out three strombolis (and have a loaf of bread waiting to go in). The Greek Goddess went over really well (I did not get any since it was first outta the oven and gone too soon – nice to use up some leftover chicken from Friday night). An Italian calzone was so good, simple too. And then there was the Schlotzsky-inspired with my version of olive salad, turkey, and pepper jack – oh boy, my favorite. Thank you for this Sunday dinner! I love stromboli. I use a homemade dough and found that it works quite well. I have a couple stromboli freezer recipes that are really good on my site. I like to stuff it with lunch meat, veggies, or both, cook and then slice up to eat for lunches the whole week. Can you use them for a quick Hot-Pocket type substitute or do they really have to thaw all day? use my benchmark year of 1982 to illustrate how the credit bubble had a very tight correlation to housing. If you are like most people, the answer is the third option. The tenant pays for the construction costs and signs a long term lease for the lot. big problem is that cheap often means rubbish. Can Pillsbury pizza refridgerator dough be used? Would it freeze ok, then thaw, and microwave. Assuming it would be prebaked?